“Take it away.” 1-2-3, 1-2-3. Each race was only 70-85 seconds. Syncopation is key. We got better after this first race which had a finishing time of 1:24.15. No one knew what to expect prior to race day. 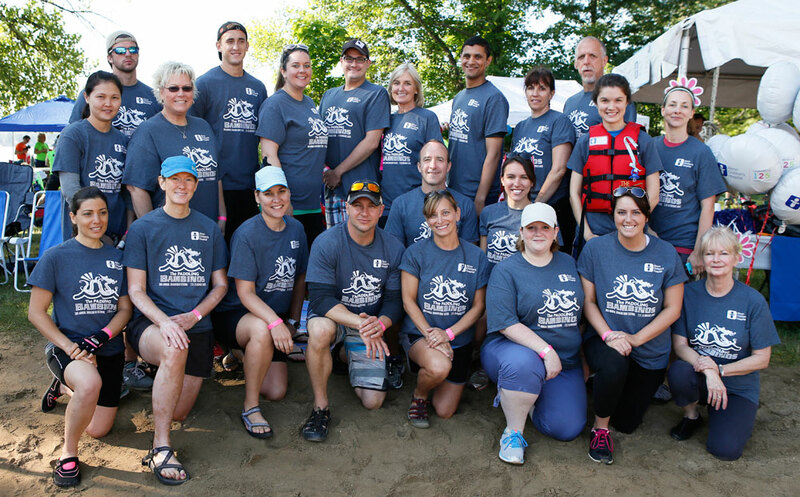 Many of us were recruited with what seemed like a random email to join the hospital’s first dragon boat team. “Sure, sounds good. I’m always up for an adventure and new experience,” I thought to myself. 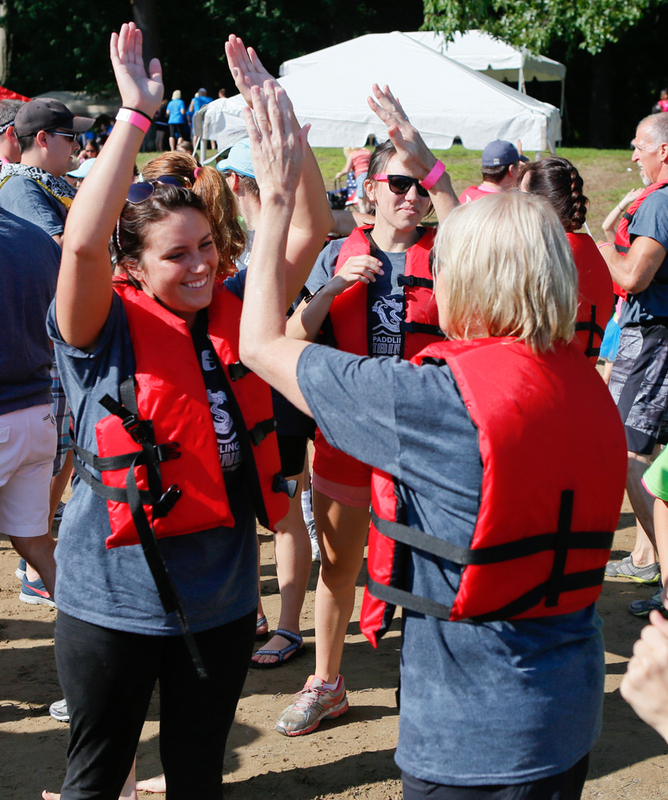 After memorizing the lingo, ordering matching T-shirts and watching some brief instructional videos on YouTube (with a few practice strokes at my desk – think “air paddling”), I realized that was the most I could be prepared to join 20 other Akron Children’s employees for our début into competitive boating at the Dragons on the Lake – Dragon Boat Festival on July 11. 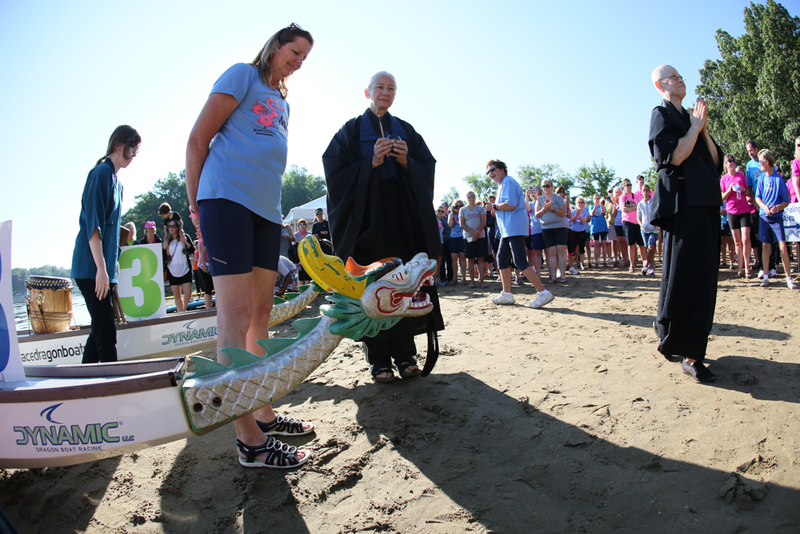 Opening ceremonies included a blessing of a boat. The event took place at Portage Lakes State Park with hundreds of seasoned and newbies like us just there to have fun and support those affected by breast cancer. 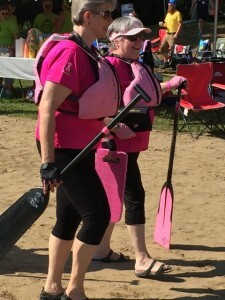 It is organized by the Dragon Dream Team, a local breast cancer survivor dragon boat team and support group, and has really grown in just 3 years. 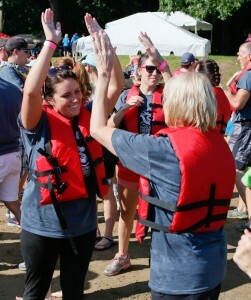 Holly Ross (right) and other breast cancer survivors formed the Dragon Dream Team 7 years ago. Pediatric nurse practitioner Holly Ross at Akron Children’s Locust Pediatric Care Group has been a member of the Dragon Dream Team since it was founded 7 years ago. “We are the first all breast cancer survivor team in the state,” Ross said. “I was never an athlete but this is a sport that anyone can do. I love that we ‘leave our cares on the shore’ while we are on the water which is so peaceful and also invigorating. According to Ross, the members are a great support to each other in all areas of their lives not just concerns about breast cancer. The group’s mission is to show that there’s a full life after the rigors of breast cancer treatment. After what seemed like weeks of straight rain, the clouds broke way for sunshine. I thought of it as a metaphor for a support group. Times can be dark and gray when you are alone, but as soon as you are with friends and feel what a strong support system can do, your concerns are eased and your wishes are heard. The encouragement was amazing to see and feel that day. I think we also walked away with a new appreciation of the practice and communication it takes to get 20 people of various athletic abilities all working together at the same intensity and cadence. That’s any lesson in success and failure, really. But it’s helpful to be reminded in a fun, casual way at times. Everyone was happy with our performance after race 2 (1:15.091), which shaved about 10 seconds off the previous time. And the cold, hard facts show it. Our first race clocked 1:24.15 – and it felt that slow…and bad. Other boats sailed between 1:07 and 1:18. We lost by more than a boat’s length. After a few “that’s OK, we are beginners,” the team was ready to do better, so we discussed improvement ideas and did a drill on land. To our surprise, the boat responded well in race 2 and rewarded us with our best time of the day: 1:15.091. Oh, the cheers and excitement! We were hoping race 3 would be 1 or 2 seconds faster to bring up our average, but it was about the same at 1:15.425, which put us in 4th place and missing the finals by just 0.3 of a second. The team was disappointed but thankful for the opportunity to spend time getting to know each other and tackling a new challenge while supporting those in need. The 2015 The Paddling Bambinos included Vishal Bhatt, Michael Bigelow, Roula Braidy, Franklin Choate, Kelly Daw, Leslee Fetterhoff, Chelsea Furda, Cynthia Hartman, Alexandria Lesak, Andrea Lever, Mary Link, Shawn Lyden, Sunday Moo, Jennifer Moore, Daniel Norman, Cathryn O’Malley, Alyssa Piteo, Kristina-Marie Rutherford, Stacy Snyder, Charles Solley, Mollie Watson, Heather Wuensch. Not pictured: Charlie Solley. Look for us next year. 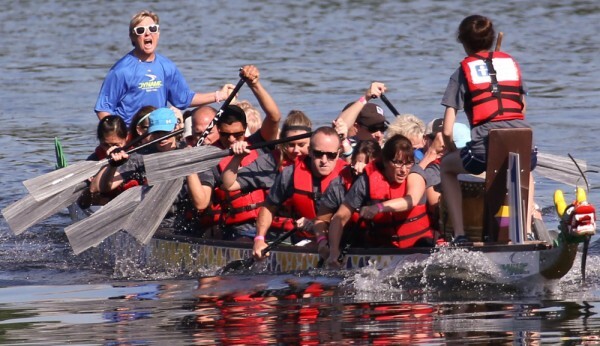 We’ll be there rain or shine with a MUCH fiercer paddle stroke for sure.